Featuring interviews with Dr. Marcia Angell (Dept. of Social Medicine, Harvard Medical School; Former Editor, New England Journal of Medicine), Dr. Bob Goodman (Columbia University Medical Center; Founder, No Free Lunch), Gene Carbona (Former Pharmaceutical Industry Insider and Current Executive Director of Sales, The Medical Letter), Katharine Greider (Journalist; Author, The Big Fix: How the Pharmaceutical Industry Rips Off American Consumers), Dr. Elizabeth Preston (Dept. of Communication, Westfield State College), and Dr. Larry Sasich (Public Citizen Health Research Group). Public Citizen Health Resource Group: Promotes research-based, system-wide changes in health care policy and provides oversight concerning drugs, medical devices, doctors and hospitals and occupational health. Consumers International: An independent non-profit organization that works for consumer rights and to hold corporations accountable, specifically in the areas of climate change, unethical drug promotion, sustainable coffee, and consumer protection. American Medical Student Association (AMSA) PharmFree Campaign: Aiming to revitalize professionalism in medical education, AMSA teaches medical students about the ethics of drug company interaction with health professionals and encourages them to make the rational, informed decision to eschew "free" gifts from the pharmaceutical industry. "As this documentary so clearly and simply shows, we need to become 'healthy skeptics' and be better prepared to face a world where disease is being sold and drug companies are bankrolling the 'education' of the general public through advertising both drugs and diseases." "As an organizer and educator around issues of mental health and Big Pharma, I've found this film to be the BEST tool in my tool chest. It's slick, convincing, credible and engaging. It inevitably generates feisty discussion." "Drug companies now spend more than $12 billion a year hawking the newest, most expensive brand-name drugs to patients and doctors in the U.S., regardless of whether those drugs are truly needed or any better than what's been available for years. 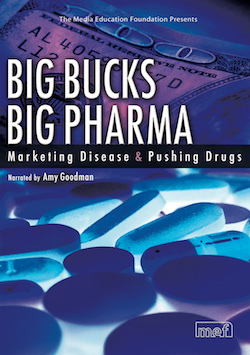 Big Bucks, Big Pharma is an incisive expose of how marketing has infected everything doctors and patients learn about drugs, and a much-needed antidote to the tidal wave of self-serving drug company propaganda that dominates the airwaves. Anyone who ever prescribes or takes a pill should see this documentary." "I applaud you and the film Big Bucks, Big Pharma. I worked in the pharmaceutical industry for 16 years, and nothing in this film surprised me." "Using excerpts from drug company advertisements as well as news reports on the pharmaceutical industry, the documentary raises important questions and presents options for consumer empowerment... If the United States is ever going to upgrade its healthcare system for all people, it will happen only if an informed public mandates change. Big Bucks, Big Pharma is a bitter pill to swallow but the prognosis is hopeful." "This documentary provides important information that addresses concerns regarding the manner in which prescription medications are being promoted to health professionals and to the public. [The interviewees] provide authoritative and insightful perspectives pertaining to the marketing of drugs. Their thought-provoking analyses and observations regarding the excessive and unbalanced marketing of medications challenge health professionals to evaluate their personal objectivity and commitment to be uncompromising in the quality and integrity of the care and services that we provide to patients. All health professionals would learn from viewing this documentary and would benefit from having a more complete understanding of the issues surrounding the marketing of drugs. Health professions organizations and colleges should include this documentary in their meetings and classes." "This doc pops the childproof lid off the bottle that is the pharmaceutical industry, exposing the way it sometimes manipulates sick folks to make a chunk of change for shareholders via better living through chemistry. Once you know the truth, you'll want a Percocet or a Xanax." "Big Bucks, Big Pharma reveals some highly shocking truth about the multibillion dollar pharmaceutical industry. The concept it presents is often overlooked; that we are relying on profit oriented billionaire pharmaceutical companies to provide us medicines and safeguard our health. ...A very informative film." "This expose on the consumer marketing practices of the pharmaceutical industry was an eye opener. We've all seen ads for drugs proliferate in the last few years. But, until we saw Big Bucks, Big Pharma we never realized the full breadth of the insidious marketing strategies of Big Pharma. Frankly, it kind of takes your breath away." "This fact-based, fast-paced documentary provides disturbing proof for its assertions, and it will cause most viewers to think about the push for pills that is affecting the economy -- and our well-being." From Anonymous of Bloomington, Indiana on 10/28/2015 . I use this film in my Medicine & Ethics course and my students really respond to it.